Following genital chlamydial infection, an early T helper type 1 (Th1)-associated immune response precedes the activation and recruitment of specific Th1 cells bearing distinct chemokine receptors, subsequently leading to the clearance of Chlamydia. We have shown that CCR5, a receptor for CCL5, is crucial for protective chlamydial immunity. Our laboratory and others have also demonstrated that CCL5 deficiencies found in man and animals can increase the susceptibility and progression of infectious diseases by modulating mucosal immunity. These findings suggest the CCR5-CCL5 axis is necessary for optimal chlamydial immunity. We hypothesized CCL5 is required for protective humoral and cellular immunity against Chlamydia. The present study revealed that CCR5 and CCL5 mRNAs are elevated in the spleen, iliac lymph nodes (ILNs), and genital mucosa following Chlamydia muriduram challenge. Antibody (Ab)-mediated inhibition of CCL5 during genital chlamydial infection suppressed humoral and Th1 > Th2 cellular responses by splenic-, ILN-, and genital mucosa-derived lymphocytes. Antigen (Ag)-specific proliferative responses of CD4+ T cells from spleen, ILNs, and genital organs also declined after CCL5 inhibition. The suppression of these responses correlated with delayed clearance of C. muriduram, which indicate chlamydial immunity is mediated by Th1 immune responses driven in part by CCL5. Taken together with other studies, the data show that CCL5 mediates the temporal recruitment and activation of leukocytes to mitigate chlamydial infection through enhancing adaptive mucosal humoral and cellular immunity. Chlamydia trachomatis is the most common sexually transmitted bacterial pathogen in the United States; infection results in devastating sequelae, including pelvic inflammatory disease and infertility. Animal models and clinical studies of infected patients have indicated that protective chlamydial immunity is primarily mediated by Th1 responses [1–3]. The induction of such immunity involves rapid recruitment and activation of certain effector immune cells, specifically Th1 cells and dendritic cells (DCs) into the local genital mucosa to clear the infection, arrest ascending disease, and prevent major complications [1, 4–7]. In addition, certain complimentary B cell functions – principally Ab-mediated enhancement of Ag presentation – lead to activation of Ag-specific Th1 cells dependent in part by Fc-receptor-mediated events [1, 8]. Thus, both cell-mediated and humoral immune responses are required for long-term protection against Chlamydia. With the major elements of protective anti-Chlamydia immunity defined, a number of candidate vaccines have been described . Chemokines have emerged as important factors and possible mucosal adjuvants that function in lymphocyte activation and recruitment [9–11]. Indeed, a qualitative relationship exists between the class of chemokines secreted following infection, the type of immune response (cellular or humoral immunity) elicited, and the fate of the host following infection [12–15]. The profile of chemokine expression serves as a reliable indicator of immune response type (i.e., Th1 vs. Th2). In this respect, the CCL5-CCR5 axis has been demonstrated to be preferentially involved in the activation and function of Thl cells [10, 16, 17]. CCL5 is secreted by epithelial cells, macrophages, fibroblasts, platelets, and activated T cells . This CC chemokine is known to regulate T cell differentiation and polarize Th1 >> Th2 subtypes [10, 13, 18, 19] as well as numerous physiological functions of leukocytes including migration. Polymorphisms in CCR5 and CCL5 modulate immune responses as well as susceptibility and progression to HIV-1 and AIDS, respectively [20, 21]. We also showed that many of the deleterious complications of genital chlamydial infection, due to Th1-mediated inflammation, are not present in individuals with the ccr5Δ32 mutation or in CCR5-deficient mice . CCR5 expression following genital chlamydial infection is followed by an early Th1-like response that precedes activation and mucosal recruitment of Ag-specific Th1 cells necessary for clearance of Chlamydia . These findings indicate that CCL5 might be important for inducing protective immunity against Chlamydia. However, it is not certain what affect CCL5 deficiency would have on chlamydial disease. We tested the hypothesis that CCL5 is essential for inducing adaptive mucosal immunity against Chlamydia by Ab inhibition using a reliable mouse model of genital chlamydial infection. Results revealed CCL5 supports the induction of Th1 cytokine and immunoglobulin IgG2a as well as IgA responses against Chlamydia. CCL5, CCR5, and IFN-γ mRNAs were measured by quantitative RT-PCR analysis after genital chlamydial infection. A significant increase in CCR5, CCL5, and IFNγ gene expression in the spleen and ILN was observed 7 days after genital infection when compared with levels before infection (Figure 1). These mRNA levels modestly declined at inductive sites 14 days after infection. CCR5, but not CCL5 or IFN-γ mRNA expression by fallopian tube-, uterus-, and cervix- derived lymphocytes were considerably higher than levels before infection. Indeed, CCR5 mRNA expression by fallopian tube lymphocytes was significantly higher 7 and 14 days post infection. These data suggest that increases in CCL5, CCR5, and IFN-γ mRNA expression during early stages of infection at inductive sites (i.e., spleen and ILN) preceded CCR5 expression at effectors sites (i.e., fallopian tube(s), uterus, and cervix). The pattern of CCL5 and CCR5 as well as IFN-γ illustrates how this chemokine axis coincides with both the innate (recognition phase, 0 to 7 days) and adaptive (activation, effector, and decline/homeostasis phases) immune responses to this pathogen and associated inflammation. CCL5, CCR5, and IFN-γ mRNA expression during Chlamydia infections. Groups of female BALB/c mice challenged with C. muridarum and total RNA was isolated from lymphocytes isolated from the spleen, ILNs, fallopian tubes, uterus, and cervix of each mouse, under sterile conditions before or 7 and 14, 21 and 42 days after challenge. The levels of CCL5, CCR5 and IFN-γ mRNA expression were ascertained after RT-PCR analysis. Log10 copies of transcripts were expressed relative to the actual copies of 18S rRNA ± SEM. Experiments were repeated 3 times to yield 15 mice per group. Asterisks (*) indicate significant differences (p < 0.01) between tissues from naïve mice. We next characterized C. muridarum-specific proliferative responses of T helper cells isolated from the spleen, ILNs, fallopian tube(s), uterus, and cervix, 42 days after challenge. CD4+ T cells isolated from these mucosal and systemic immune compartments of C. muridarum-infected and control Ab-treated mice exhibited marked increases in Ag-specific proliferative responses compared to disease-free (uninfected) or C. muridarum-infected and anti-CCL5 Ab-treated mice (Figure 2). Notably, systemic and mucosal inductive sites of the spleen and ILN, respectively, contained Ag-specific CD4+ T cells that significantly proliferated after C. muridarum re-stimulation. These results suggest that CCL5 is required for optimal generation of Chlamydia-specific CD4+ T cells that proliferate after Ag recognition. Chlamydia-specific CD4 + T cell proliferation. Groups of naïve or female BALB/c mice challenged with C. muridarum and received 100 μl of control Ab or anti-CCL5 Ab solution every 3 days. Following sacrifice 42 days after challenge, spleen-, ILN-, fallopian tubes-, uterus-, and cervix-derived CD4+ T cells were purified and cultured at a density of 5 × 106 cells/ml with 106 cells/ml of γ-irradiated feeder splenocytes for 3 days. Proliferation of CD4+ T cells was measured by BrdU incorporation. The data presented are the mean OD450 for proliferative ± SEM of quadruplicate cultures. Experiments were repeated 3 times to yield 15 mice per group. Asterisks (*) indicate statistically significant differences (p < 0.01) between untreated, control Ab-treated mice and mice treated with anti-CCL5 Ab. To test the role of CCL5 in Th1-biased humoral responses to genital infection, we measured Chlamydia-specific IgG1, IgG2a, IgG2b, IgG3 and IgM Abs in sera as well as Ag-specific IgA and IgG Abs in vaginal washes. Infected mice that received control Ab displayed significantly higher levels of Chlamydia-specific serum IgG2a, followed by IgG2b responses than compared to similar mice that received anti-CCL5 Ab or mock-infected (i.e., naïve) mice (Figure 3). Analysis of vaginal secretions revealed a significant increase in Ag-specific IgA Ab responses in C. muridarum-challenged mice that received control Ab when compared with similar mice that received anti-CCL5 Ab or uninfected animals. These results indicate C. muridarum infection enhanced Th1-biased humoral responses and CCL5 blockade attenuated Chlamydia-specific IgG2a serum responses as well as vaginal IgA responses. Serum and vaginal Ab responses of mice infected with genital Chlamydia. Groups of naïve or female BALB/c mice challenged with C. muridarum and received 100 μl of control Ab or anti-CCL5 Ab solution every 3 days. Following sacrifice 42 days after challenge, Chlamydia-specific serum and vaginal Ab responses of mice were determined by ELISA that was capable of detecting > 20 pg/ml of IgM, IgG, IgA, and IgG subclass Abs. The data presented are the mean concentration of IgG1, IgG2a, IgG2b, IgG3, IgM, IgG, or IgA ± SEM of three separate experiments. Experiments were repeated 3 times to yield 15 mice per group. Asterisks (*) indicate statistically significant differences (p < 0.01) between untreated and control Ab- or anti-CCL5 Ab-treated mice. Genital Chlamydia infection up-regulated Ab responses as well as splenic and ILN CD4+ T cell proliferative responses. We next examined whether these effects were mediated in part through T helper cytokine responses. 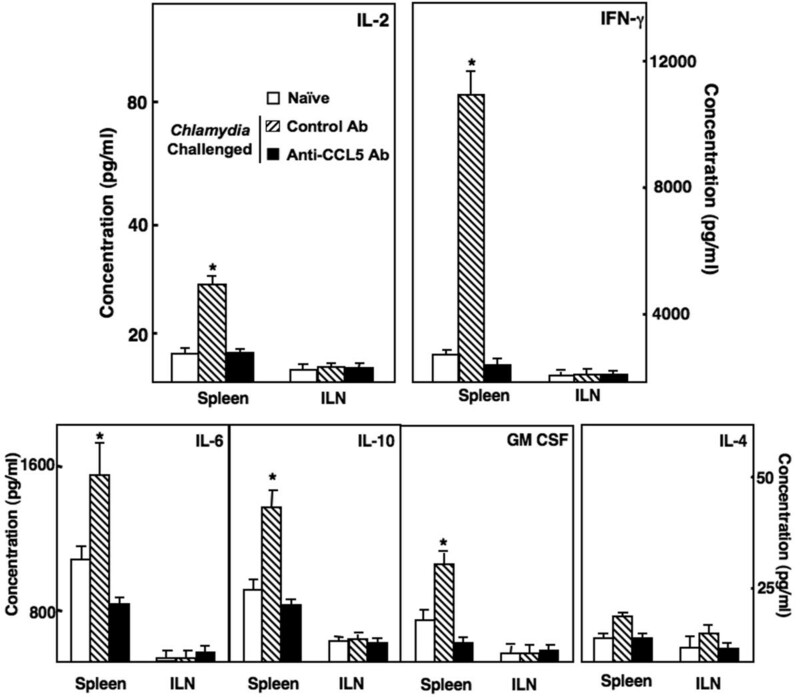 IL-2 secreted by Ag-stimulated splenic CD4+ T cells from infected mice that received control Ab was significantly higher than levels from cells isolated from similar mice that received anti-CCL5 Ab or uninfected mice (Figure 4). The secretion of IFN-γ from splenic, but not ILN, CD4+ T cells from C. muridarum-infected and control Ab-treated were considerably higher than T helper cells isolated from similar mice treated with anti-CCL5 Ab or uninfected animals. Chlamydial infection of mice lead to the development of CD4+ T cells that significantly secreted IL-6, IL-10, and GM-CSF, but not IL-4, in response to C. muridarum re-stimulation. Anti-CCL5 Ab-treated mice infected with C. muridarum resulted in T helper cells with reduced IL-6, IL-10, and GM-CSF secretion following Ag re-stimulation when compared to CD4+ T cells from similar mice treated with control Ab; however, the secretion pattern of Th2 cytokine responses by CD4+ T cells isolated from ILNs did not significantly change. These results indicate that C. muridarum infection invoked splenic, but not ILNs, Chlamydia-specific CD4+ T cells that secreted Th1 cytokines as well as IL-6, IL-10, and GM-CSF, which were reduced by CCL5 blockade. The extent of chlamydial infection, determined by C. muridarum detected in cervico-vaginal swabs, was significantly higher in mice receiving anti-CCL5 Ab treatment than compared to control mice (Figure 5). However, all mice resolved chlamydial infection in < 90 days. T helper cytokine secretion by CD4 + T cells from Chlamydia -infected mice. Groups of naïve or female BALB/c mice challenged with C. muridarum and received 100 μl of control Ab or anti-CCL5 Ab solution every 3 days. Following sacrifice 42 days after challenge, spleen- and ILN-derived CD4+ T cells from these mice were purified and cultured at a density of 5 × 106 cells/ml with 106 cells/ml of γ-irradiated feeder splenocytes for 3 days. Cytokines present in cultured supernatants were determined by ELISA that was capable of detecting < 10 pg of IL-2, IFN-γ, IL-4, IL-6, IL-10, or GM-CSF. The data presented are the mean cytokine (pg/ml) ± SEM of quadruplicate cultures. Asterisks (*) indicate statistically significant differences (p < 0.01) between untreated and control Ab- or anti-CCL5 Ab-treated mice. Changes in Chlamydia -shedding. Mice treated with control Ab or anti-CCL5 Ab were infected with C. muridarum. The status of infection was monitored for live organism shedding by culturing periodic cervico-vaginal swabs from individual mice every week for 42 days after challenge. Chlamydia present in swabs were detected by infecting McCoy cells with vaginal swab rinses and staining infected monolayer with FITC-labeled, genus-specific, anti-Chlamydia Abs to count inclusion bodies (> 10 IFUs/ml) by direct immuno-fluorescence. BD indicates the presence of Chlamydiae was below this level of detection. Experiments were repeated 3 times to yield 15 mice per group. Asterisks (*) indicate statistically significant differences (p < 0.01) between untreated and control Ab- or anti-CCL5 Ab-treated mice. Th1-mediated immune responses are essential to control the chlamydial infection . It has been shown in previous studies that CCL3, CCL4 and CCL5 enhance adaptive immunity through Th1 cytokine and co-stimulatory molecule modulation [10, 11, 15, 16]. In this study, we demonstrate some of the cellular and molecular mechanisms of CCL5-mediated chlamydial immunity. Importantly, IFN-γ mRNA was not significantly elevated 14 days after C. muridarum infection. IL-12p40 mRNA expression coincided with CCL5, but typically preceded IFN-γ mRNA expression (data not shown). Indeed, early genital clearance of Chlamydia has been shown to occur in an IL-12-dependent and IFN-γ-independent fashion ; so, further studies will be required to dissect the roles of IL-12 and CCL5 in Chlamydia clearance and immunity. The present study shows that 7 days after genital Chlamydia infection, CCL5, CCR5, and IFNγ mRNA levels were elevated in inductive sites, while CCR5 mRNA expression was higher in the fallopian tubes than in the uterus and cervix. To this end, similar yet differential chemokine expression patterns have been reported within anatomically distinct regions . CD4+ Th1 cells (and associated cytokines, chemokines, etc.) are critical elements in the immune response, stimulated by an ascending C. trachomatis infection in the female genital tract . Indeed, studies of chlamydial infection in knockout mice support the importance of class II MHC, CD4, IL-12, IFN-γ, and IFN-γ receptor for chlamydial immunity [27–30]. Our data suggest that CCL5 interactions are comparably important and mediate the temporal recruitment and activation of T cells to mitigate chlamydial infection through protective mucosal adaptive immunity by enhancing Th1 >> Th2 humoral and cellular immune responses. CCL3 and CCL4 are also CCR5 ligands, but these chemokines were not remarkably elevated compared to CCL5, which was the most abundant CCR5 ligand expressed during the early stages (i.e., < 7 days) of chlamydial infection. CCL5 is an important factor in the homing of lymphocytes that express CCR5, CCR4, CCR3 and CCR1 [31–33]. It was also demonstrated from our earlier studies that CCL5 can increase the proliferation and activation of Ag stimulated T lymphocytes . These findings coincide with marked increases in CCL5 and IFN-γ production by CD4+ T cells during chlamydial infection. It is also plausible that CCL5 blockade might reduce the ability of innate immune cells (e.g., NK cells, macrophages, etc.) to respond to C. muriduram challenge. Previously, we demonstrated that CCL5 inhibition decreased the numbers of NK1.1+ and CD11b+ leukocytes at mucosal effector sites following pneumococcal challenge . However, T cells were the primary lymphocyte-subtype that were reduced following CCL5 blockade during the hyper cellular response to Streptococcus pneumoniae in mice. Genital Chlamydia infection of mice enhanced Ag-specific Abs in serum and vaginal secretions as well as proliferative cytokine responses by CD4+ T cells isolated from systemic and mucosal compartments. High levels of IgA in cervical secretions in infected women correlate with low numbers of C. trachomatis shedding and B cells are required to eliminate Chlamydia in a secondary infection . We have previously shown that CCL5 induces Ag-specific titers of IgG2a, followed by IgG2b, IgG3, and IgG1 , CCL3 and CCL4 enhance Ag-specific IgG1 and IgG2b responses . In this study, Chlamydia infection enhanced IgG2a Ab responses, which were reduced after CCL5 inhibition. This highlights the importance of this chemokine in Th1-associated Ab responses against Chlamydia. The precise cytokine signals required for S-IgA production are not completely understood and studies show both Th1-and Th2-type cell-derived cytokines are important for S-IgA production [36–38]. We have previously shown that chemokines like XCL1 and CCL5 induce IgA production [9, 10]. The sharp IgA Ab response generated by Chlamydia-infected mice also correlated with the predominant Th1 >> Th2 cytokine response induced by this infection, which were reduced by CCL5 blockade. These results suggest that CCL5 is required in part for optimal Chlamydia-specific IgA Ab responses during C. muridarum infection. Mucosal, but not serum, IgA Abs were selectively elevated after C. muridarum challenge, presumbably due to the compartmentalized common mucosal immunity system. In particular, IgA Ab-secreting cells predominantly populate the lamina propria of the mucosa. In contrast, Chlamydia-specific IgG Abs were not detected in vaginal secretions. This confirms other studies that show vaginal Chlamydia-specific IgG Abs are not present at high levels (relative to IgA) in vaginal washes after C. muridarum challenge [39, 40]. However, intranasal, subcutaneous or transcutaneous immunization using mucosal adjuvants can induce vaginal wash Ag-specific IgG Ab titers that are comparable to those of IgA [9, 41–45]. IFN-γ production is often associated with IgG2a production  and may account for the systemic humoral responses against Chlamydia following vaginal challenge. In the present study, Chlamydia infection induced a profound IgG2a Ab response compared to other IgG subclass Abs. The analysis of mucosal and systemic responses revealed a bias toward Th1 >> Th2 type of responses. While little is known regarding Ag-specific CD4+ T cell (IL-4 and GM-CSF) secretory responses during Chlamydia infection, we show that these T helper cytokines were increased during chlamydial infection. CCL5 blockade diminished these cellular responses along with C. muridarum-specific CD4+ T cell secretion of IFN-γ and IL-2. Contradictory studies demonstrated the ability of CCL5 to promote both Th1-and Th2-type responses. It was reported that anti-CCL5 Ab treatment in mice decreased mycobacterial-inducible Th2-type lesions while increasing schistosomal-inducible Th2-type granulomas . However, studies from our laboratory suggest CCL5 enhances mucosal and systemic humoral responses through help provided by Th1-type cytokines and select Th2-type cytokines, with CCL5 promoting Th1 and Th2 responses . The results in the present study suggest that CCL5 is required for optimal Th1 cellular responses against and clearance of Chlamydia. These results corroborate our previous findings that CCR5-dependent mucosal immune responses are required for the efficient clearance of genital chlamydial infection, while functional CCR5 expression reduces infertility as a pathologic consequence of Th1-mediated inflammation associated with infection . The ccl5 gene has a number of physiologically relevant single nucleotide polymorphisms that affect its function and expression. In particular, the In1.1T/C haplotype of ccl5 is highly prevalent (~37%) in African Americans, than compared to Americans of European origin (~0.3%), and results in significantly lower CCL5 expression . This has been attributed to some of the health disparities between these ethic/racial groups; specifically, higher human immunodeficiency virus (HIV) susceptibility and faster progression to acquired immune deficiency syndrome (AIDS). Similar to the ccr5Δ32 polymorphism, the data in this study and others suggest diminished CCL5-CCR5 interactions could yield reduced fallopian tube scarring, but could also result in higher transmission/shedding of Chlamydia via decreased chlamydial clearance. It is plausible that a host with a modestly compromised innate immune system would on one hand – avoid infertility by mounting reduced Th1 responses and on the other – be unable to optimally clear a chlamydial infection. This would provide an evolutionary rationale for not only ccr5Δ32 and In1.1T/C ccl5 polymorphisms, but also the propagation and transmission of Chlamydia. No doubt, demonstration of this postulate will require additional and extensive studies. Understanding the cellular and molecular mechanisms that CCL5 uses to modulate mucosal immunity is essential to better understanding the pathogenesis of chlamydial infection. We tested the hypothesis that CCL5 is essential for inducing adaptive mucosal immunity against Chlamydia. We conclude that CCL5 supports the induction of Th1 cytokine and IgG2a Ab as well as IgA Ab responses against Chlamydia. The suppression of CCL5 correlated with delayed clearance of C. muriduram infection, which suggests chlamydial immunity is mediated by Th1 immune responses driven in part by CCL5. Stocks of the Chlamydia muridarum (trachomatis agent for mice) were prepared by propagating elementary bodies (EBs) in McCoy cells and used to infect mice as previously described . The stocks were tittered by infecting McCoy cells with varying dilutions of EBs. The infectious titer was expressed as inclusion-forming units per milliliter (IFU/ml). Murine anti-CCL5 was produced as previously described . Briefly, rabbits were immunized with murine CCL5 (Pepro-Tech) and the hyper immune CCL5 antisera obtained was yielded titers of ~1:106 such that 10 μl of rabbit CCL5 antiserum neutralized 20 ng of CCL5. This antiserum was titrated by direct ELISA, and no cross-reactivity was detected when tested against other CCR5 ligands, chemokines and cytokines. Subsequently, antisera were heat-inactivated and purified using an IgG isotype-specific protein A column (Pierce). Anti-CCL5 Ab titers were adjusted to 1 : 4 × 105 (i.e., 50× dilution) in PBS (Ab solution) for CCL5 blocking experiments. Similarly prepared normal or preimmune rabbit serum was used to generate the control Ab solution. Female BALB/c mice, ages 6 to 8 weeks, were purchased from Jackson Laboratory and used to establish a colony at the Morehouse School of Medicine animal facility. The animals were housed and maintained in isolator cages under specific-pathogen-free housing conditions. The guidelines proposed by the Committee for the Care of Laboratory Animal Resources Commission of Life Sciences-National Research Council were followed to minimize animal pain and distress. These studies were approved by the Morehouse School of Medicine Institutional Animal Care and Use Committee (IACUC). Seven days prior to infection, mice received 2.5 mg of medroxy-progesterone acetate (Depo-Provera; The Upjohn Co.) by subcutaneous route in 100 μl of PBS . Groups were intravaginally infected with 5 × 104 IFU of C. muridarum under phenobarbital anesthesia, whereas uninfected control mice received only phosphate buffered saline (PBS). Mice (15 mice per group) received 100 μl of either control or anti-CCL5 Abs by intraperitoneal injection, 24 hrs before chlamydial infection and every 72 hrs thereafter. The extent of unresolved chlamydial infection was monitored by taking cervico-vaginal swabs from individual mice every week until 42 days after the challenge . Briefly,Chlamydia present in swabs were detected by infecting McCoy cells vaginal/swab rinses and staining infected monolayer with fluorescein isothiocyanate (FITC)-labeled, genus-specific, anti-Chlamydia Abs (Kallestad Diagnostics) to verify inclusion bodies (> 10 IFUs/ml) by direct immuno-fluorescence . Vaginal cavities were rinsed three times with 50 μl of PBS to obtain mucosal secretions. Blood collected by retro-orbital bleeding and serum was separated following centrifugation. Serum and mucosal secretions were collected on 0, 7, 14, and 42 days post challenge and analyzed by ELISA. Following sacrifice by CO2 inhalation, spleen, ILN, fallopian tube(s), uterus, and cervix tissues were aseptically removed and single-cell suspensions were prepared by passing tissues through a sterile wire screen to quantify mRNA expression and T helper responses. Reproductive tract tissues were further disrupted to generate single cell suspensions by stirring in collagenase type IV (Sigma) in RPMI 1640 (collagenase solution) at 37°C for 30 min. Lymphocytes were further purified using a discontinuous Percoll (Pharmacia) gradient, collected at the 40/75% interface. CD4+ T cells were enriched using Mouse CD4 Cellect® plus columns according to manufacturer's protocol (Biotex Laboratories). Cell suspensions were washed twice in RPMI 1640 and lymphocytes were maintained in medium supplemented with 10 ml/L of nonessential amino acids (Mediatech), 1 mM sodium pyruvate (Sigma), 10 mM HEPES (Mediatech), 100 U/ml penicillin, 100 μg/ml streptomycin, 40 μg/ml gentamycin (Elkins-Sinn), 50 μM mercaptoethanol (Sigma), and 10% fetal calf serum (FCS) (Atlanta Biologicals). Purified CD4+ T cells were cultured at a density of 5 × 106 cells/ml with 106 cells/ml γ-irradiated (3,000 rads) naïve splenic feeder cells in complete medium in the presence or absence of 10 μg/ml of UV-inactivated C. muridarum inclusion bodies (IBs) as Ag at 37°C in 5% CO2. After 3 days of culture, cells were pulsed with BrdU labeling solution and incorporation was detected by ELISA (Roche Molecular Biochemical). Similarly, cell culture supernatants were collected 3 days after culture and assayed for cytokine secretion by Luminex assay . Chlamydia-specific serum IgG subclass antibodies and vaginal wash IgA levels were quantified 6 weeks after challenge by ELISA . Briefly, 96-well Falcon ELISA plates (Fisher Scientific) were coated with 100 μl of anti-IgG or IgA Ab (BD-PharMingen) or 10 μg/ml of UV-inactivated C. muridarum IBs in PBS O/N at 4°C and blocked with 10% FCS in PBS for 2 hrs at RT. IgM, IgG subclasses or IgA standards, and experimental samples were serially added after diluted with PBS. After O/N incubation at 4°C and three washes using PBS containing 0.05% Tween 20 (PBS-T), Ag-specific titers of IgM, IgG, IgA, or IgG subclass Abs were determined following the addition of biotinylated detection Abs (BD-PharMingen). After incubation and wash steps, anti-biotin HRP Ab (Vector Laboratories Inc., Burlingame, CA) in PBS-T was added to detection wells and incubated for 1 hr at RT. Following incubation, all plates were washed 6 times and the color reaction was developed by adding 100 μl of 1.1 mM 2,2'-azino-bis(3)-ethylbenzthiazoline-6-sulfonic acid (Sigma) in 0.1 M citrate-phosphate buffer (pH 4.2) containing 0.01% H2O2 (ABTS solution). The presence of the following T helper cell-derived cytokines in culture supernatants was determined by Beadlyte™ mouse multi-cytokine detection system kit (BioRad): interleukin (IL)-2, IL-4, IL-6, IL-10, granulocyte monocyte cell stimulating factor (GM-CSF), and interferon (IFN)-γ. Filter-bottom ELISA plates (BioRad) were rinsed with 100 μl of Bioplex assay buffer and the buffer was removed using a Millipore™ multiscreen separation vacuum manifold system set at 5 mm Hg. Analyte beads in assay buffer were added into wells, followed by 50 μl of serum or standard solution and incubated for 30 mins at RT with continuous shaking (at setting #3) using a Lab-Line™ Instrument Titer Plate Shaker (Melrose, IL). The filter-bottom plates were washed as before and the buffer was removed using a Millipore™ multiscreen separation vacuum manifold system. Subsequently, 50 μl of anti-mouse IL-2, IL-4, IL-6, IL-10, GM-CSF, or IFN-γ Ab-biotin reporter solution was added in each well and the plates were incubated with continuous shaking for 30 mins followed by centrifugation and washing. Next, 50 μl of streptavidin-phycoerytherin (PE) solution was added and the plates were incubated with continuous shaking for 10 mins at RT. 125 μl of Bio-plex assay buffer was added and Beadlyte™ readings were measured using a Luminex™ System and calculated using Bio-plex™ software (Bio-Rad). The cytokine Beadlyte™ assays were capable of detecting > 5 pg/ml for each analyte. Total RNA from the spleen, ILNs, fallopian tube, uterus, and cervix leukocytes was isolated from mouse treated with anti-CCL5 or control Ab using Tri-reagent™ (Molecular Research Center, Cincinnati, OH). Potential genomic DNA contamination was removed from these samples by treatment with RNase-free DNase (Invitrogen) for 15 mins at 37°C. RNA was then precipitated and re-suspended in RNA secure (Ambion). cDNA was generated by reverse transcribing approximately 1.5 μg of total RNA using Taqman™ reverse transcription reagent (Applied Biosystems). Mouse mRNA sequences of CCL5, CCR5, IFN-γ, and 18S rRNA were obtained from the NIH-NCBI gene bank database accession numbers NM03653, D83648, K00083, and X00686.1, respectively. These sequences were then used to design primers for real-time polymerase chain reaction (RT-PCR) analysis, which generated amplicons of 97, 100, 98, and 149 base pairs size, respectively, for CCL5 (sense-TCG TGT TTG TCA CTC GAA GG and antisense- GCT GAT GGC CTG ATT GTC TT), CCR5 (sense- CGA AAA CAC ATG GTC AAA CG and antisense- GGG AAG CGT ATA CAG GGT CA, IFN-γ (sense- ACT GGC AAA AGG ATG GTG AC and antisense- GTT CTC CTG TGG ATC GGG TA), and 18S rRNA (sense-GTA ACC CGT TGA ACC CAA TT and antisense- CAA TCC AAT CGG TAG TAG CG). Primers were designed using the primer 3 software program from Whitehead Institute at the Massachusetts Institute of Technology (MIT). Thermodynamic analysis of primers was conducted using the following computer programs: Primer Premier™ (Integrated DNA Technologies) and MIT Primer III (Boston, MA). The resulting primer sets were compared against the entire murine genome using the National Center for Biotechnology Information (NCBI) to confirm specificity and ensure that the primers flanked mRNA splicing regions. cDNA was generated as before and amplified with specific cDNA primers using SYBR® Green PCR master mix reagents (Applied Biosystems). The copy number (> 10) of mRNA relative to 18S rRNA copies was evaluated by RT-PCR analysis using the BioRad Icycler and software (Hercules, CA). Data were expressed as the mean ± standard error of mean (SEM), compared using a two-tailed student's t-test or an unpaired Mann Whitney U-test, and considered statistically significant if p < 0.01. When cytokine levels were below detection (BD) limit, they were recorded as one-half the lower detection limit (e.g., 5 pg/ml for IL-10) for statistical analysis. Senthilkumar K Sakthivel, Udai P Singh contributed equally to this work. This work was supported in part by National Institute of Health grants RR03034, GM08248, MD000525, AI41231 and AI57808 and the Smith & Lucille Gibson Endowment in Medicine. This research was also supported in part by the Intramural Research Program of the National Institute on Aging, National Institutes of Health. The content of this manuscript benefited from many fruitful conversations with colleagues at Morehouse School of Medicine, Centers for Disease Control & Prevention, and University of Louisville as well as editing by Andrew Marsh. SKS and UPS carried-out all animal studies. SKS quantified serum and vaginal wash Ab levels as well as C. muriduram shedding. UPS isolated and measured mRNA levels as well as T cell cytokine secretion. DDT provided CCL5 and anti-CCL5 Ab as well as helped to draft the manuscript. JUI provided C. muriduram EBs and determined the corresponding titer. JWL as well as JUI conceived the study, participated in its design with all authors, coordinated and helped to draft the manuscript with the assistance of all authors. All authors read and approved the final manuscript. The authors declare that they have no competing interests.